This system uses an efficient heat exchanger to separate the potable domestic water supply from the floor’s anti-freeze mixture. Only one heat source is used and the benefits of freeze protection can be fully utilized. Most often heat exchangers are used for freeze protection, but another application would be a radiant system with one heat source that, for one reason or another, must be separated from the domestic water supply. This is rare. Even the need for freeze protection is often overrated because a radiant system stores so much heat in the mass of the home. A heat exchanger system using antifreeze can protect the radiant heating system down to -60 below zero. But the tradeoff is efficiency. Transferring heat from one medium to another (in this case, from potable water to antifreeze via the heat exchanger) costs BTU’s. The heat exchanger itself becomes warm and radiates into the surrounding air, though sometimes this heat helps warm a living space…even if that space is only a utility room. Quite often, the heat exchanger is insulated to minimize this effect. Nevertheless, any heat radiating from the heat exchanger is thermal energy that could have gone to your floors. In addition, antifreeze as a heat transfer medium is inferior to plain water. Overall, a heat exchanger system is 10 to 20% less efficient than an open system. Of course, water has a nasty habit of freezing at temperatures below 32 degrees and in some situations this reality far outweighs the negatives of using a heat exchanger. Heating a second home in a remote location prone to power outages would be a perfect profile for a heat exchanger system. In this scenario, you can drain the domestic water system if you leave for weeks in the winter and the antifreeze protects the heating system. Heating a remote building may be another example. If you’re sending water through a buried insulated pipe above the frost line, antifreeze is essential. Solar collectors almost always use antifreeze, so a heat exchanger is necessary in this application also. The important point to understand is that most of the time heat exchangers are not essential in a radiant system. The Polaris high efficiency water/space heater comes standard with two pairs of hot and cold entry and exit ports. This makes it ideal for use with a heat exchanger. 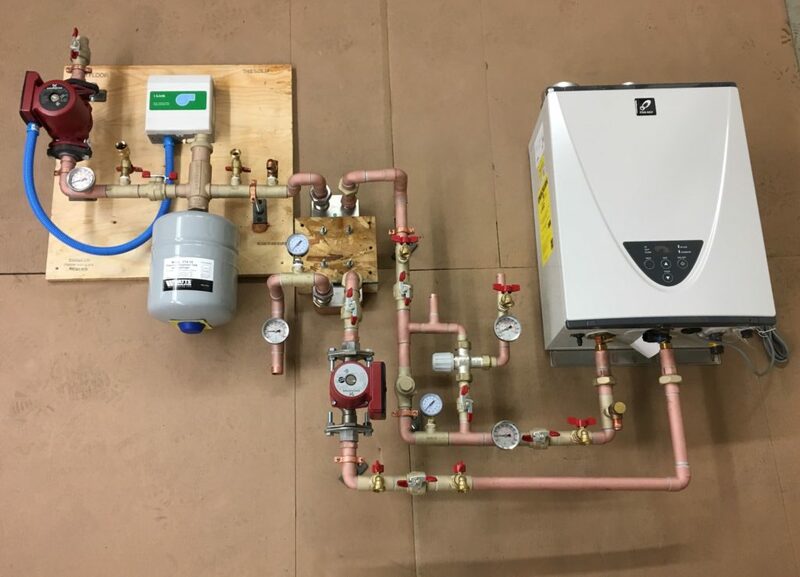 With this pre-assembled heat exchanger plumbing package (photo above, schematic below), the on-demand water heater can provide both space heating (using anti-freeze) and domestic hot (potable) water. Cut a flat plate heat exchanger in half and you’ll find stacks of stainless steel plates. The two dissimilar fluids (normally water on one side, antifreeze on the other) flow between alternating plates. The fluids themselves never mingle, but heat flows easily from the hotter to the cooler fluid. It is important to plumb a heat exchanger in “counterflow” rather than in “parallel”. Counterflow means that the hottest fluid entering Side A of the heat exchanger flows toward the coolest fluid entering from Side B on the opposite end of the heat exchanger (see illustration above). This maximizes heat transfer by forcing the coolest fluid to continuously flow toward the hottest part of the heat exchanger. 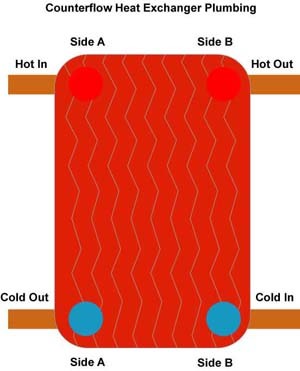 Plumbing in parallel would bring Side A “hot” and Side B “cold” into the same end of the heat exchanger and both would flow parallel down the length of the heat exchanger. Of course, this inefficient plumbing configuration will still transfer some heat from the hotter to the cooler fluid, but a full 40% of the heat exchanger’s capacity is lost. Sometimes a heat exchanger isn’t a flat plate-type at all, but instead, is located INSIDE a storage tank. Not surprisingly, these are called “internal heat exchangers”. The advantages with the internal style are simplicity and efficiency. Simple because only one pump is needed to move the heat around, and efficient because although the external heat exchanger transfers heat from one medium to another VERY quickly, it also radiates heat to the surrounding air. Internal heat exchangers aren’t as quick at transferring heat, but the heat has nowhere to go but to the surrounding water (which, one might argue, also leaks heat to the surrounding room — oh well, nothing is 100% efficient). 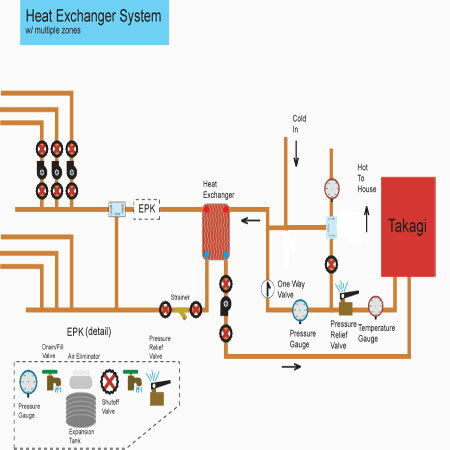 So it really comes down to application, that is, which type of heat exchanger is best suited for a given heating system. Some systems use both types, as can be seen below. 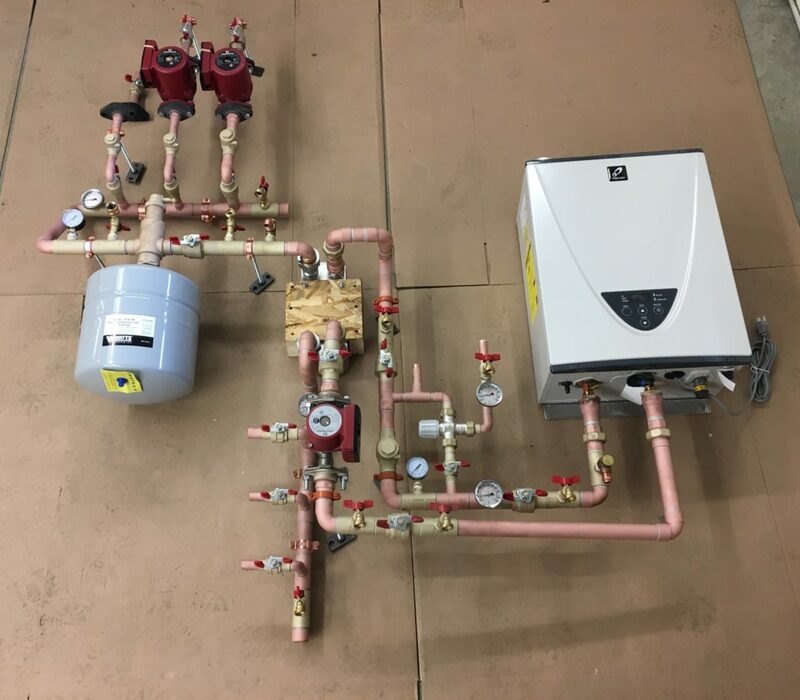 This is a plumbing schematic we drew up for a customer who wanted a wood boiler to heat a tank of water, which in turn provided both the home’s domestic hot water AND the radiant floor heat. Oh, and the radiant floor had to contain anti-freeze, i.e. it had to be “closed”. As you can see, this is a very complex heating system. Most radiant systems are far simpler. But, as an example of how vision can become reality, see the photo below of the finished installation. The storage tank with the internal heat exchanger is located beyond the frame of this photo, but it’s part of this extraordinary example of do-it-yourself craftsmanship. 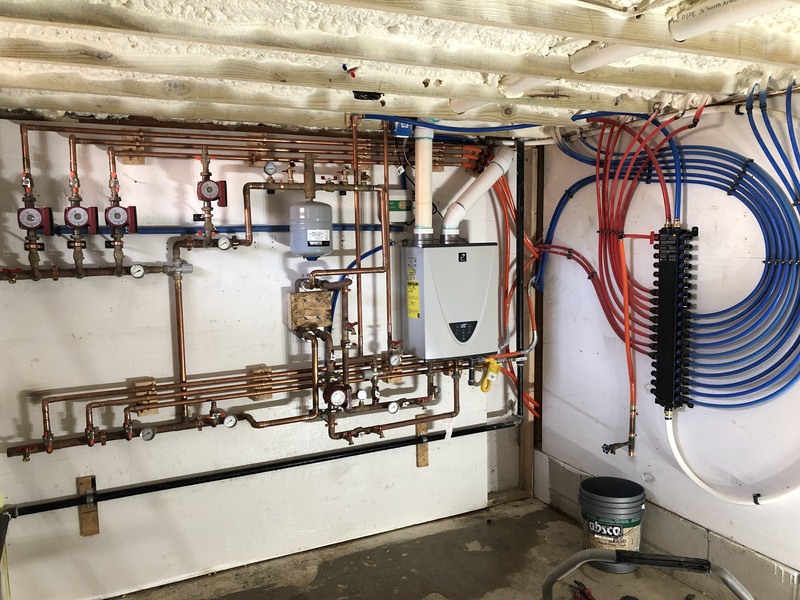 Our customer, Robin Ellins, proves that pride of ownership and attention to details, along with Radiant Floor Company’s pre-assembled plumbing packages, can result in a heating system that rivals even the most elaborate professional installation. The following drawing outlines the copper fittings necessary to connect various sizes of Expansion and Purge Kits to the Zone Manifold. These fittings and a hard copy of this drawing are included with every Closed and Heat Exchanger system.